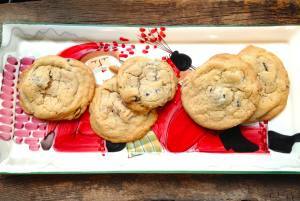 I feel like a have a thousand chocolate chip cookies on the blog, and all are noteworthy. So when my mom tried this new chocolate chip cookie recipe, I wasn’t expecting much. Boy was I wrong. 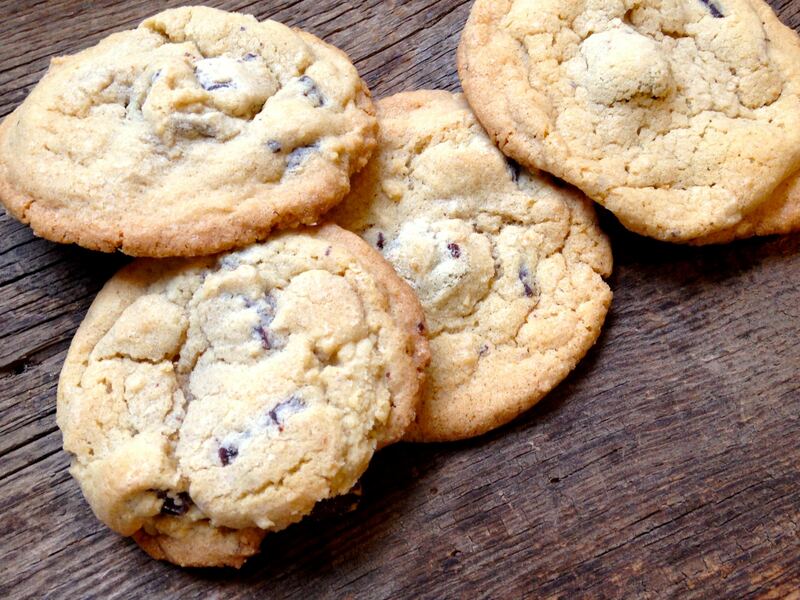 Johnny Iuzzini’s killer chocolate chip cookies are wonderful, and definitely in my top 4! (Neimans chocolate chip cookies, chocolate chip dream cookies, and Jolene’s oatmeal chocolate chip cookies tie for #1, #2, and #3. I like them all for different reasons and can’t pick a winner). Each cookie is unique in it’s own way. 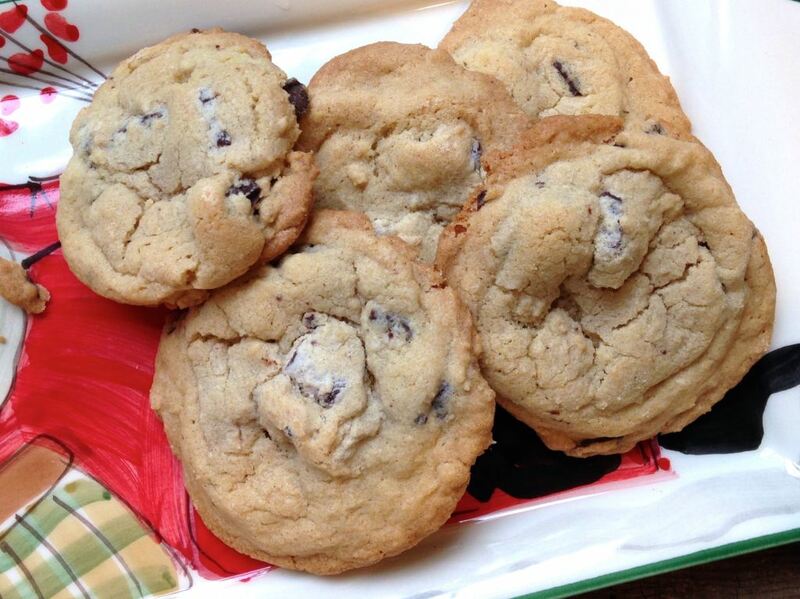 The Neiman’s cookies are great because they are super easy and have espresso powder in them. The chocolate chip dream cookies have instant vanilla pudding mix, and Jolene’s oatmeal chocolate chip cookies have everything; oats, milk chocolate, semi-sweet chocolate, and nuts! What makes Johnny Iuzzini’s recipe unique you ask? It’s the almond extract. I’ve never had a chocolate chip cookie with anything but plain ole vanilla extract, and I could immediately taste the almond extract, which was delicious. These cookies also have a little bit of cinnamon, which I love in desserts, but it’s not very predominant; so don’t worry. Sea salt is included, which is a perfect combination to the sweet chocolate chunks. These cookies are also easy to bake, and don’t require refrigeration of the dough. A lot of cookie recipes require refrigeration, which I find is super annoying, even if it makes the cookies taste better. I’m impatient, and don’t like chilling the dough. I want to bake and eat them as fast as I can!! Preheat oven to 350 degrees F. Line 2 baking sheets with silicone baking mats or parchment paper. Put the butter, granulated sugar, and brown sugar into a standing mixer bowl and toss with your fingers until the butter is coated. Attach the bowl and paddle to the mixer and beat the butter and sugar on medium-low speed until a thick paste forms with no visible butter lumps. Add the vanilla and almond extracts and mix well. With the motor on low speed, add the egg and egg yolks, one at a time, mixing well between additions. Stop the mixer and scrape down the bowl with a rubber spatula. Meanwhile, in a separate bowl, sift together the flours, baking powder, baking soda, and cinnamon; sprinkle the kosher salt on top. With a mixer on low speed, slowly add the dry ingredients to the butter mixture, stopping frequently to scrape down the bowl. Mix until just combined; removed the bowl from the mixer and fold the chocolate into the dough by hand. Using a small ½ ounce ice cream scoop, scoop level balls of dough and arrange them around 2 inches apart on the lined cookie sheets. Bake for 12-13 minutes, rotating the pans once, until just set and bottoms are beginning to brown. Cool for 10 minutes on the pans before transferring to a rack to cool completely. 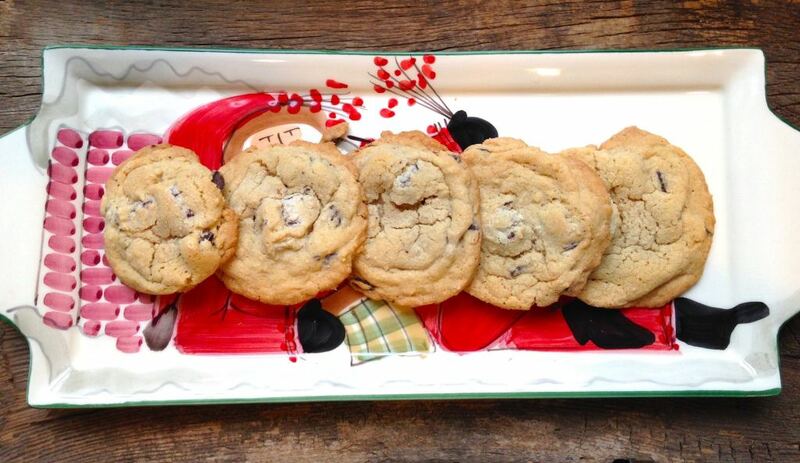 One Response to "Johnny Iuzzini’s Killer Chocolate Chip Cookies"